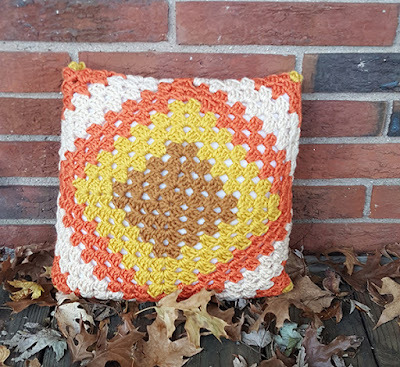 This Fall Harvest Pillow is so pretty and cozy looking! You have plenty of time to get it made up before Thanksgiving, plus I'm sure these can be done in other color themes for other holidays and year-round decor. Here's Kara! 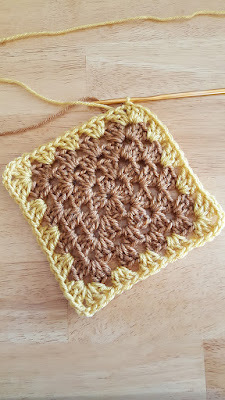 I love granny squares. They’re one of the most versatile crochet things you can make. 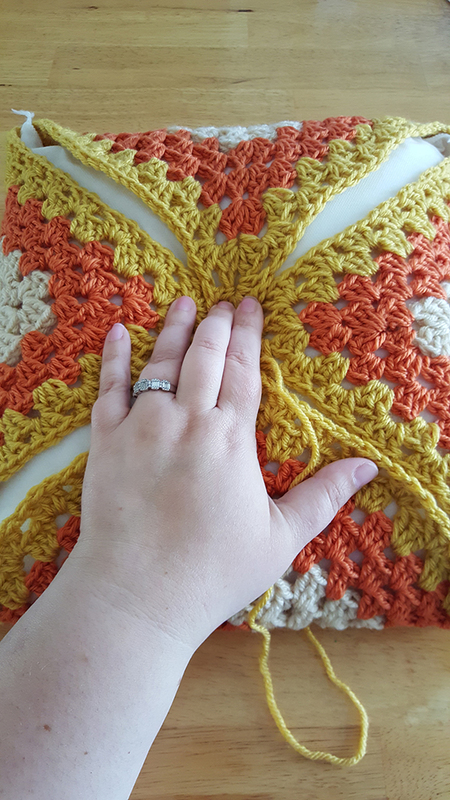 One great big granny square can be a blanket, or you can sew a bunch together to make a scarf, a hat, or a blanket. Grannies are usually one of the first thing someone learns to crochet, because they’re built on a repeating pattern. 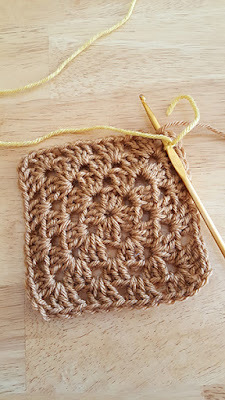 This is another reason I love them; you don’t have to be super careful counting stitches or rows. 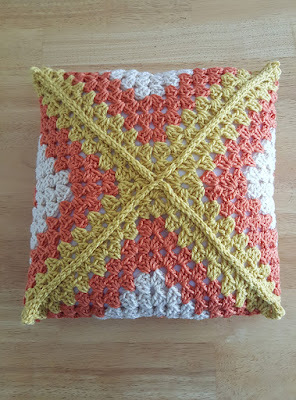 This pillow is a great first project for anyone who wants to learn crochet, or who has just started. 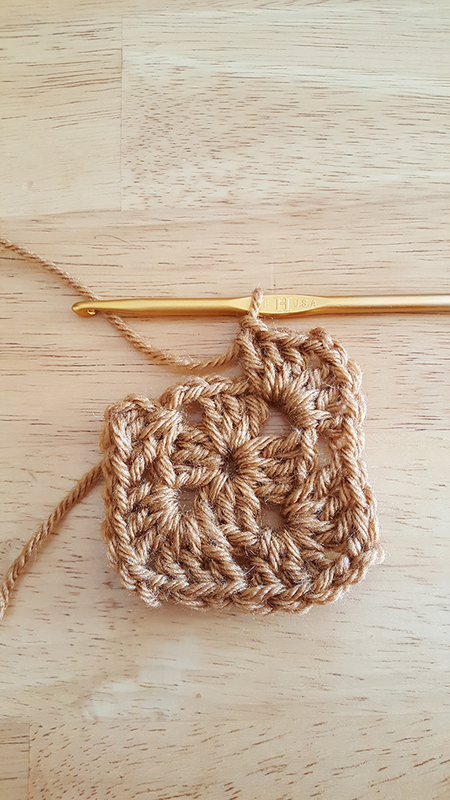 All you need to know to make this pattern is a chain, double crochet, and slip stitch. 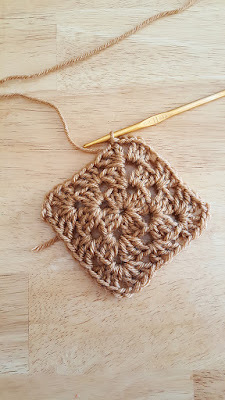 If you haven’t used these stitches before, make sure you check out our YouTubetutorial on how to crochet- it will teach you everything you need to know! 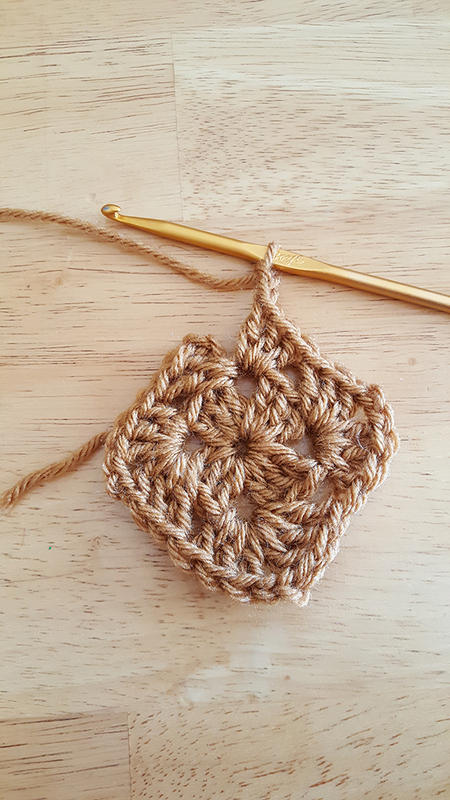 To start your granny square, you’ll first make a chain of 3. 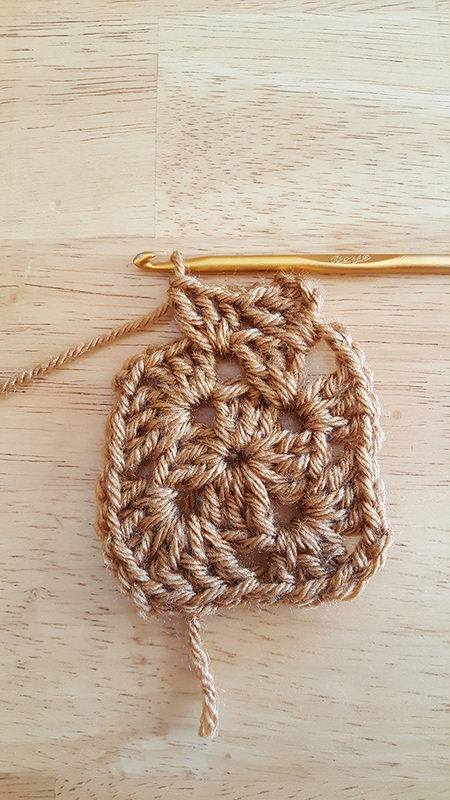 Then you’ll do one double crochet in the very first chain. Add a second double crochet into the same chain. 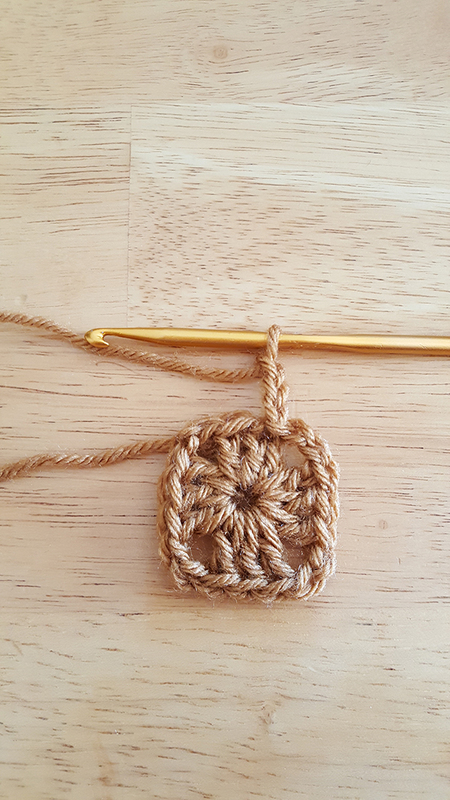 Then chain 2 from the top of your double crochet. 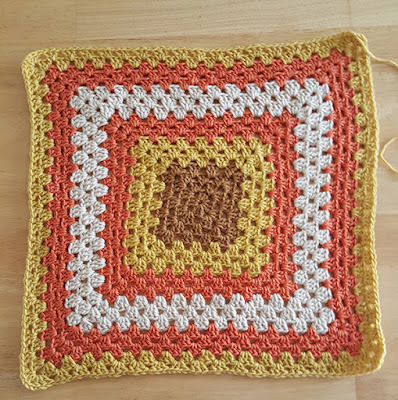 Your first corner is made! 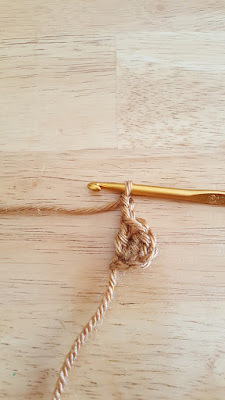 Now you’ll do another 3 double crochet in the same chain, then chain 2 two more times in the same space. You should now have 4 sets of 3 double crochet, and 4 chain 2 spaces. Now you’re going to do a slip stich into the top of the very first chain 3. 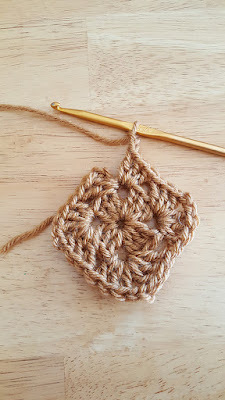 Now you’ll chain 3, this will count as a double crochet here and for the rest of the square. 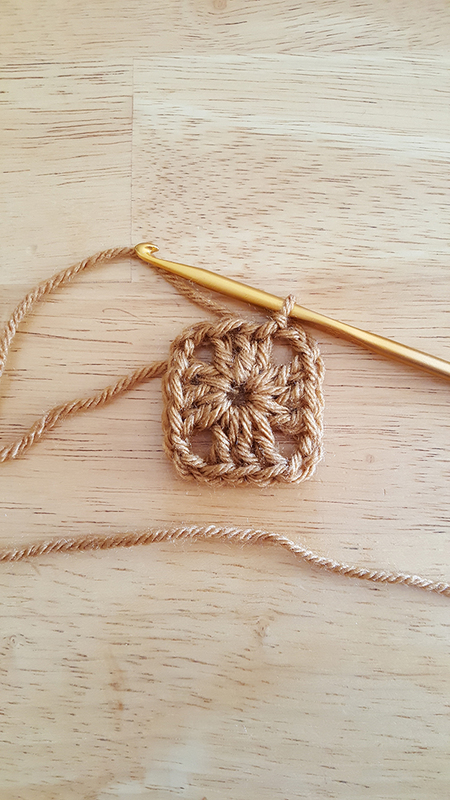 In the next chain 2 space, you’ll make 3 double crochet, chain 2, and make another 3 double crochet. Repeat this in the next 2 chain 2 spaces. 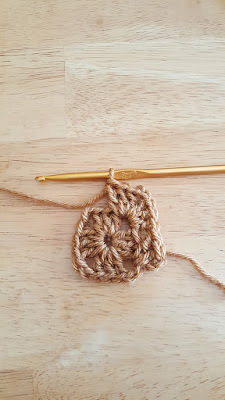 In the last chain 2 space you’ll have the 3 double crochet from the start of the round, now you’ll make another 3 double crochet and then chain 2. 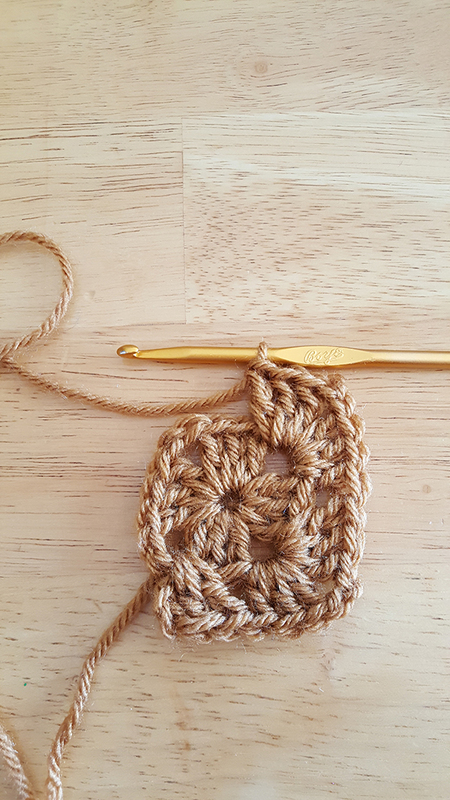 You’ll then join the round together with a slip stitch into the top of your very first chain 3. 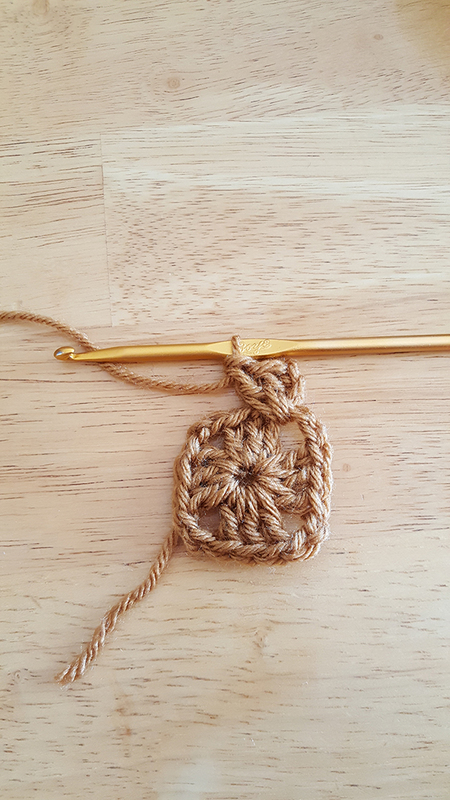 To start the next round you’ll chain 3, then make 2 double crochet in the chain 2 space from the round below. You’ll see the next space isn’t a corner, but just a space in between. 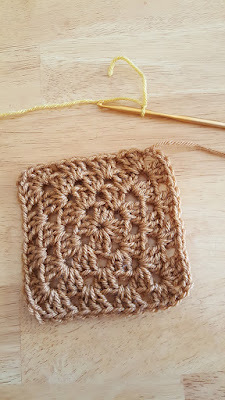 In this space, you’ll make 3 double crochet. 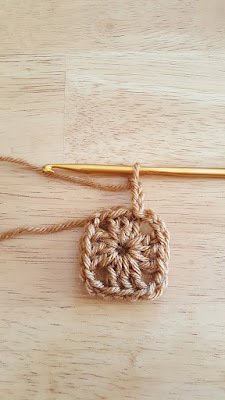 This is how the square increases in size in each round. Now you’re back to the corner so you’ll do a set of 3 double crochet, 2 chains, 3 double crochet in your chain 2 space of your corner. 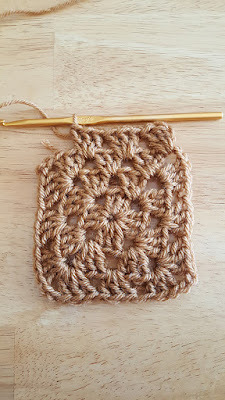 Continue the pattern around the row doing a set of 3 double crochet in the space between the corners, and 3 double crochet 2 chains and 3 double crochet in each corner until you get to the last corner. 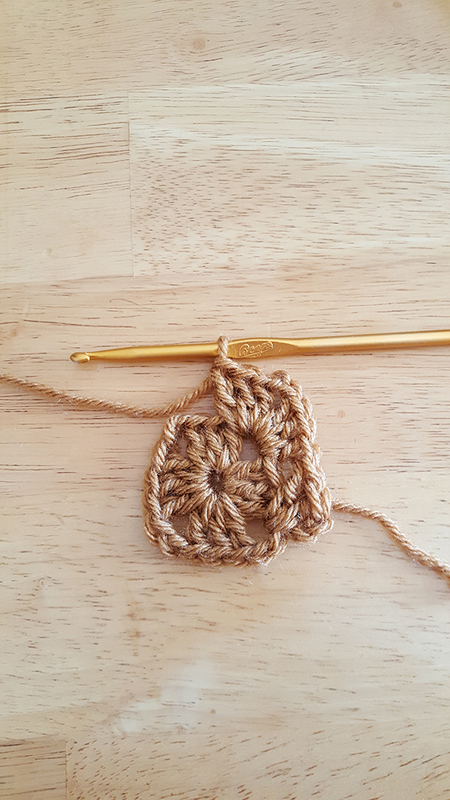 At the last corner, you’ll do three double crochet and 2 chains, then join the round into the top of the first chain 3 you made. For the next round, start off the same as you have been, chain 3 and 3 double crochet in the first chain 2 space, for this round you’ll do 2 sets of three double crochets in the spaces before you get to the next chain 2 corner. 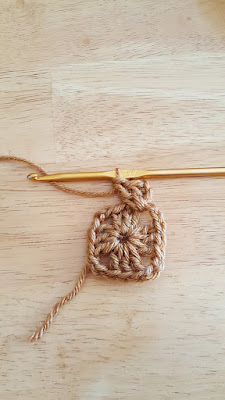 Follow this pattern all the way around doing 3 double crochet, 2 chains, and 3 double crochet in each chain 2 space, and 2 sets of 3 double crochet in the spaces between your corners. 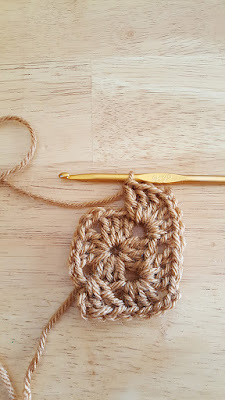 When you reach the last corner, you’ll finish the same as you have been by doing 3 double crochet, chain 2, and join with a slip stitch to the top of the first chain 3 of the round. 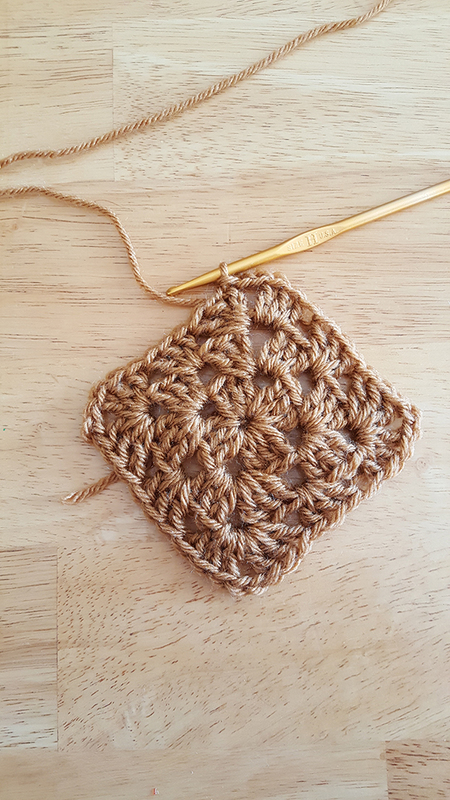 You’ll continue this pattern all the way around your square for each round from here on out. Starting with a chain 3 and 2 double crochet in the corner, then 3 double crochet in each space between the corners, 3 double crochet, 2 chains, and 3 double crochet in each corner until the last corner. 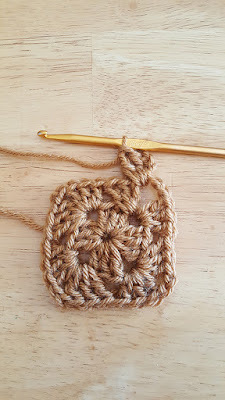 On the last corner, you’ll do 3 double crochet and 2 chains before joining with a slip stitch to the top of the first chain three of the round. 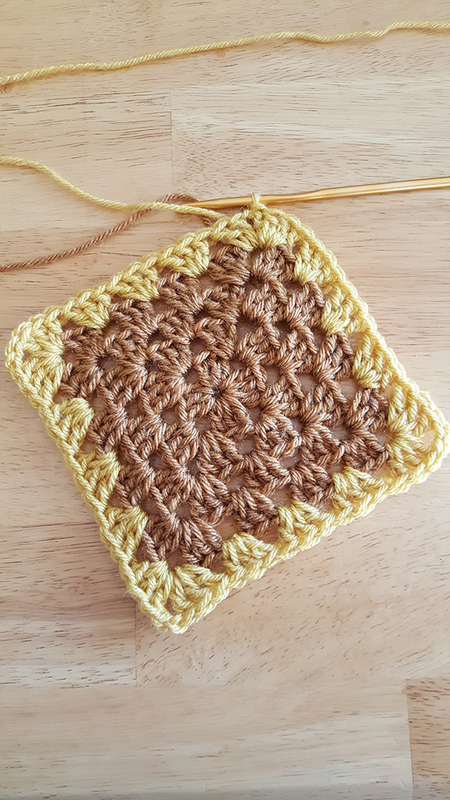 If you want to add a different color into your square, you’ll finish off your first color at the end of your round. 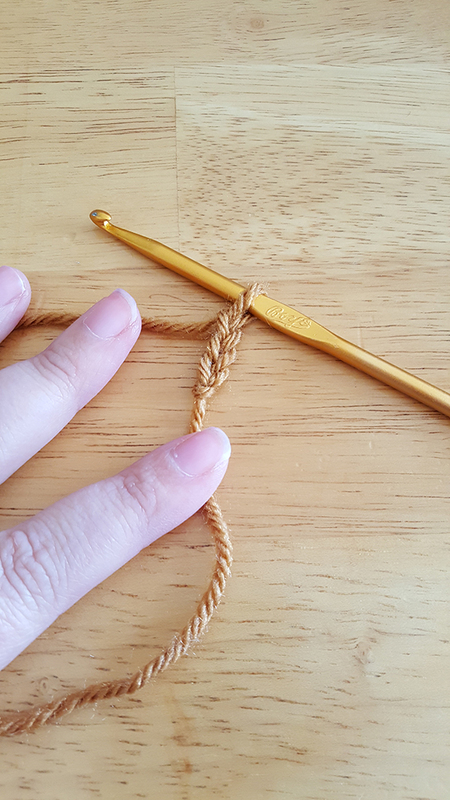 After you make your slip stich, cut your yarn, and pull the tail all the way through. Then attach your new color to your hook and chain 3 in any corner space you wish. From here it’s the same pattern that you’ve already been doing. 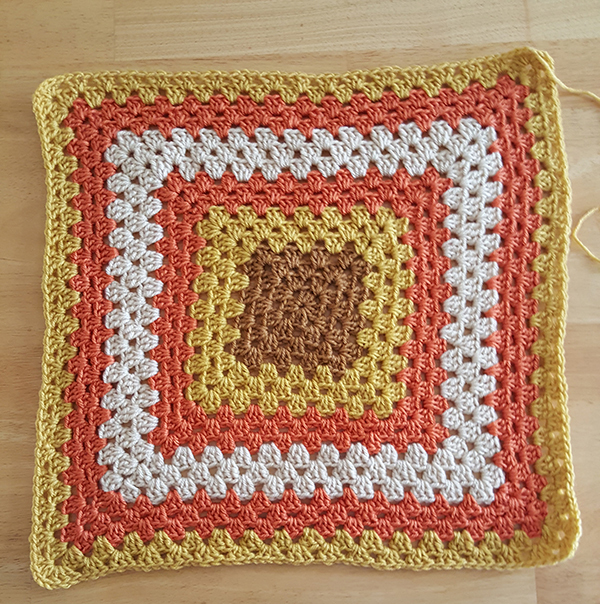 You’ll follow this pattern to keep increasing your square and changing the yarn colors as you see fit until your square is approximately twice the size of your pillow form. To check to see if you’re getting close simply lay your pillow form on your square, and fold the ends over to see if they meet. You don’t want it to match up perfectly, it needs to stretch a bit to fit otherwise the cover will be too large. 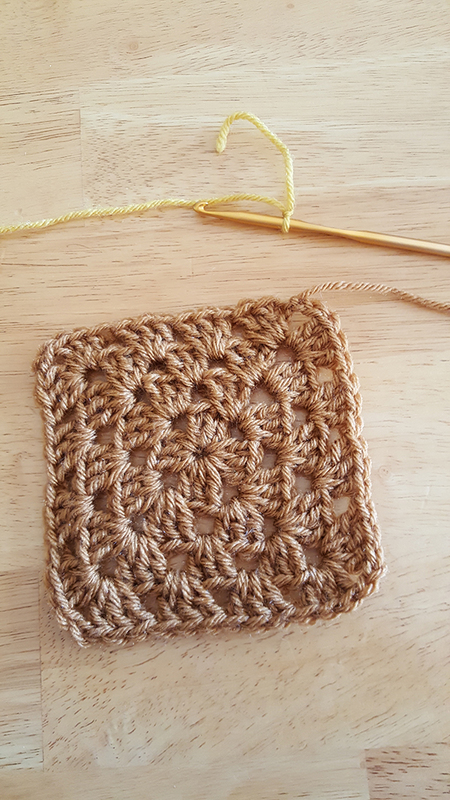 Once it’s the correct size, you’ll fold three corners of your square in to meet in the middle, so that your cover looks like an envelope. Now you’ll be closing two of the sides. 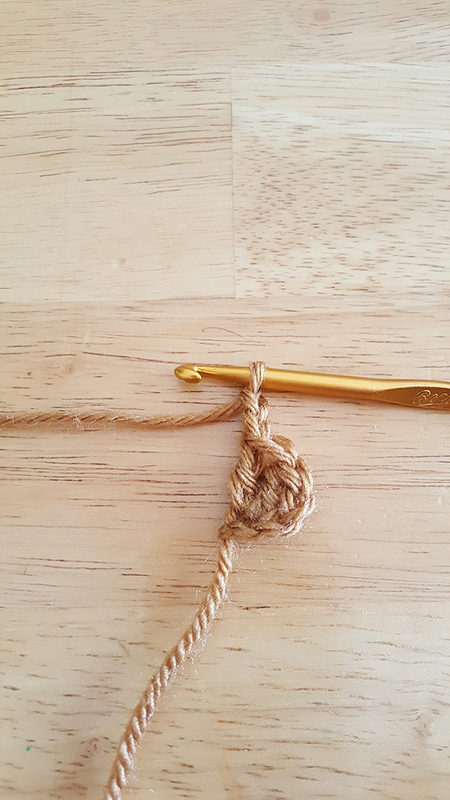 Attach your yarn to your hook, and you’ll make a slip stich into one of the corners. 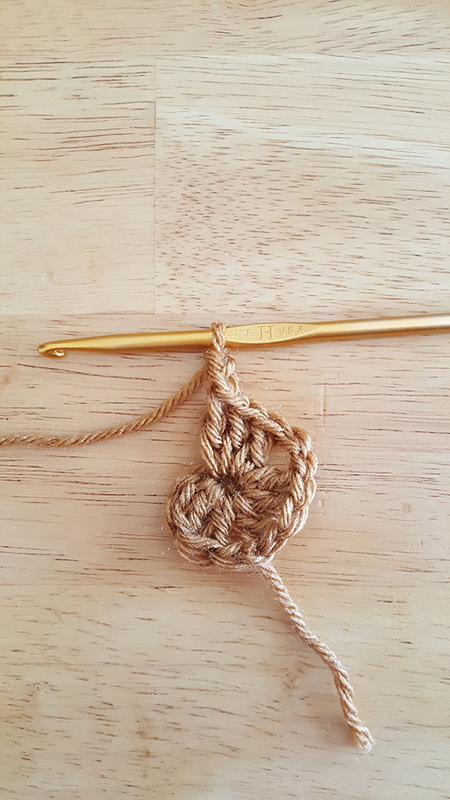 It’s very important to make sure that you make your slip stich through both sides to make sure that you’re stitching the opening closed. 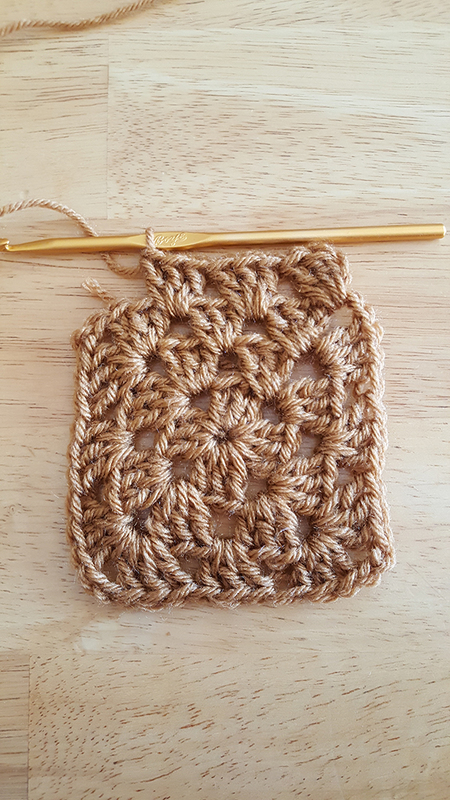 Keep slip stiching all the way up until you get to the point where the corners meet. 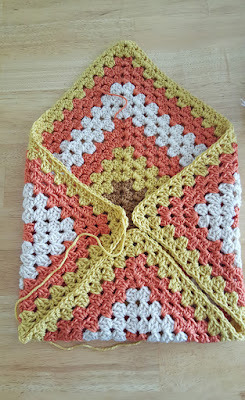 At this point, turn your cover and start slip stiching all the way back down the other side until you reach the bottom. 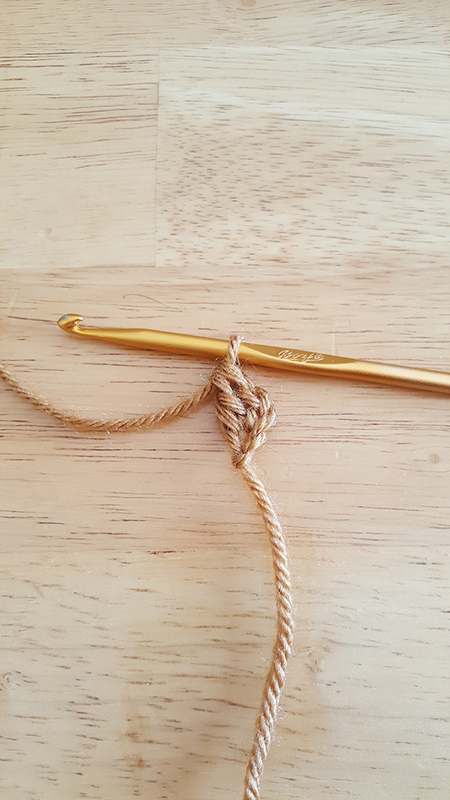 Fasten off your yarn and weave in your ends. 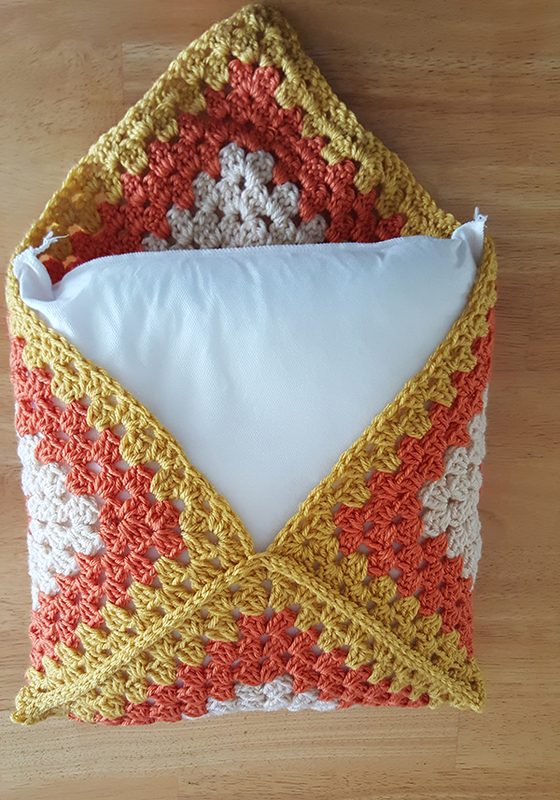 Now you’re going to place your pillow form into your cover. 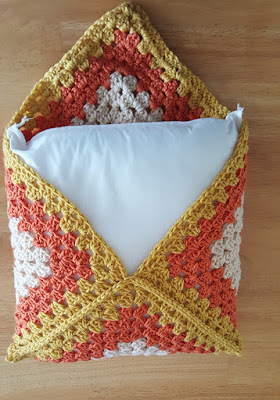 Before doing this, you can make a fabric cover for the pillow form in a solid color if you don’t want the white of the blank form to show through. 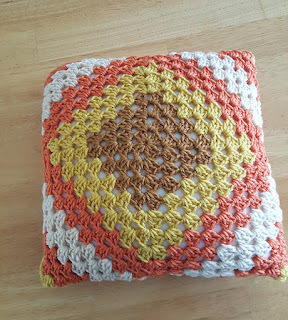 For this tutorial, I skipped that step, and just left the pillow form plain. Now we’re going to close the last two sides just like we did the first. 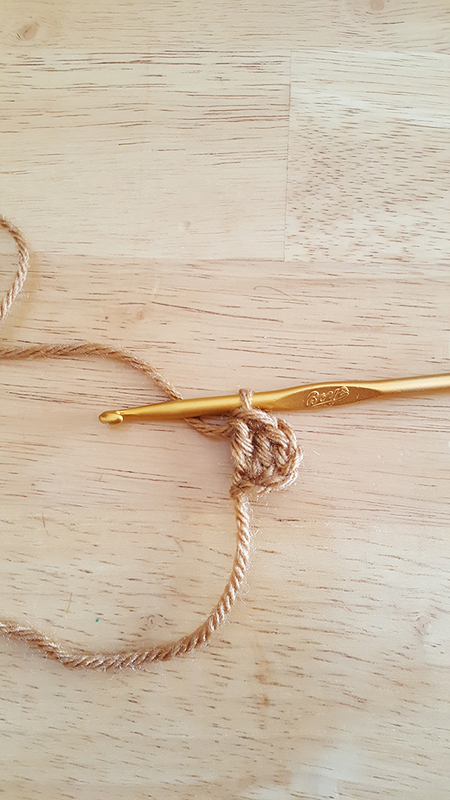 Attach your yarn to your hook and slip stich all the way up one side as you did before. 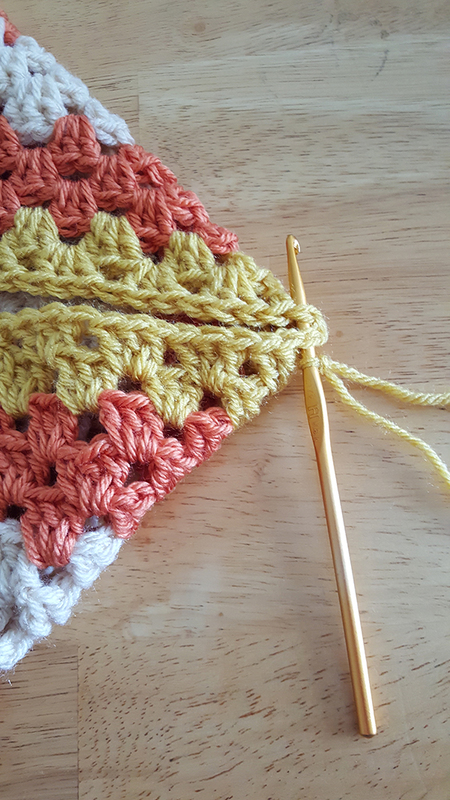 At the meeting point make sure you slip stich the two sides together before going back down the last side. At the bottom, fasten off your yarn and weave in your ends. The back and front of your finished pillow will look like this. 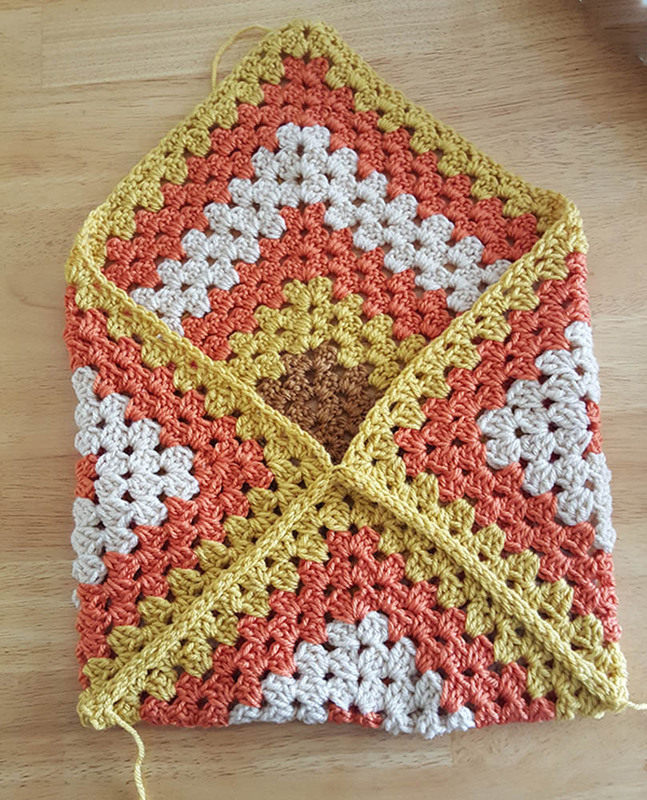 That’s it you’re all done! 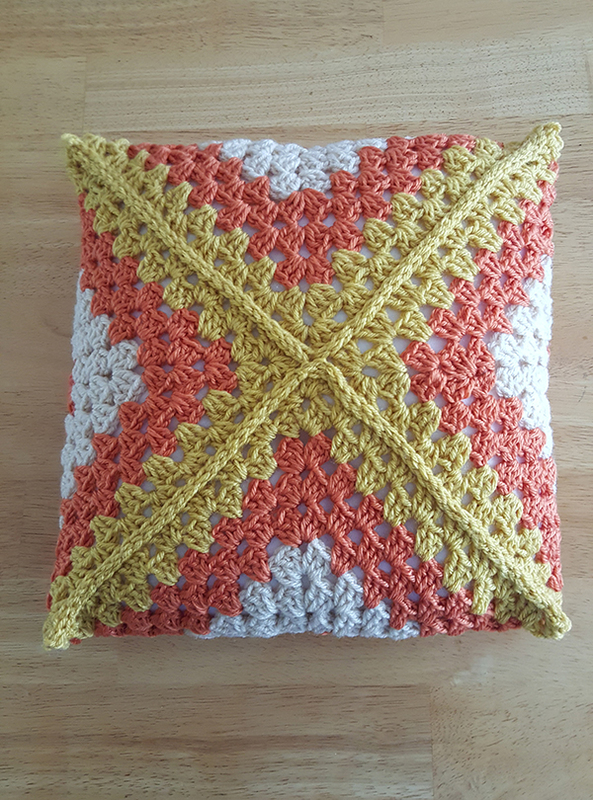 And now you’ve got a great seasonal pillow to decorate with! 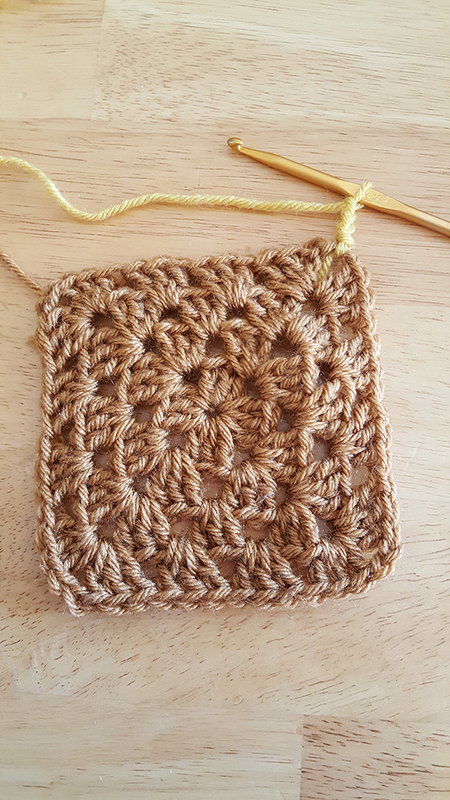 Make a bunch for different seasons to switch out throughout the year, or make some in colors to go in your kids’ rooms for an extra pillow!